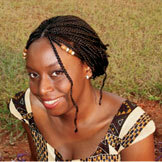 Chimamanda Ngozi Adichie, internationally acclaimed Nigerian-born author, will read from and discuss her new novel of the Biafran civil war, “Half of a Yellow Sun” (2006), which Joyce Carol Oates called “a worthy successor to such 20th century classics” as “Things Fall Apart” and “A Bend in the River,” on Tuesday, October 16, 2007 at 8:00 p.m. in the Recital Hall, Performing Arts Center, on the UAlbany uptown campus. Earlier that same day at 4:15 p.m. she will present an informal seminar in the Assembly Hall, Campus Center, on the uptown campus. The events are sponsored by the New York State Writers Institute and are free and open to the public. Adichie’s second novel is “Half of a Yellow Sun” (2006), which follows the fates of three individuals during Nigeria’s bloody Biafran civil war. The protagonists are Ugwu, an impoverished child soldier conscripted into the ragtag Biafran army, and Olanna and Kainene, twin daughters of a well-educated, upper class family. The novel was co-winner of the 2007 Anisfield-Wolf Book Award and the 2007 PEN “Beyond Margins” Award, and winner of the United Kingdom’s Orange Broadband Prize for Fiction.